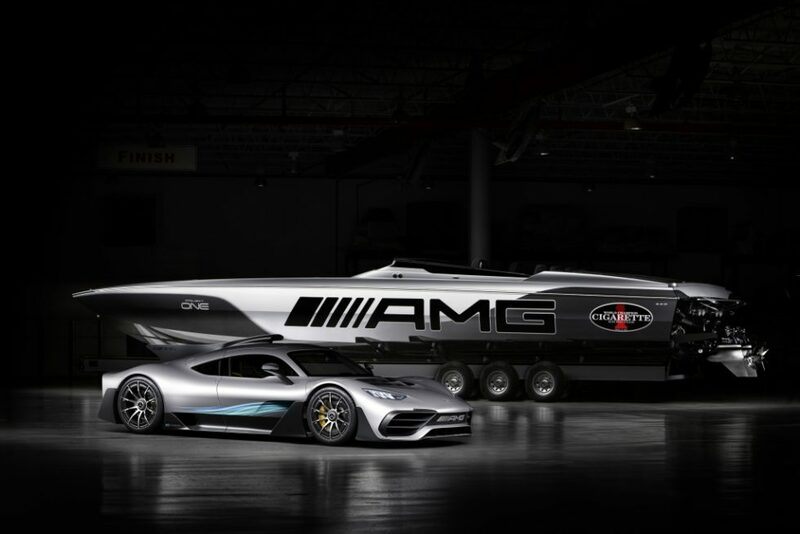 Mercedes-AMG and Cigarette Racing are proud to mark 11 years of collaboration with the debut of the most impressive and innovative performance boat ever constructed by the iconic Miami-based boat manufacturer. 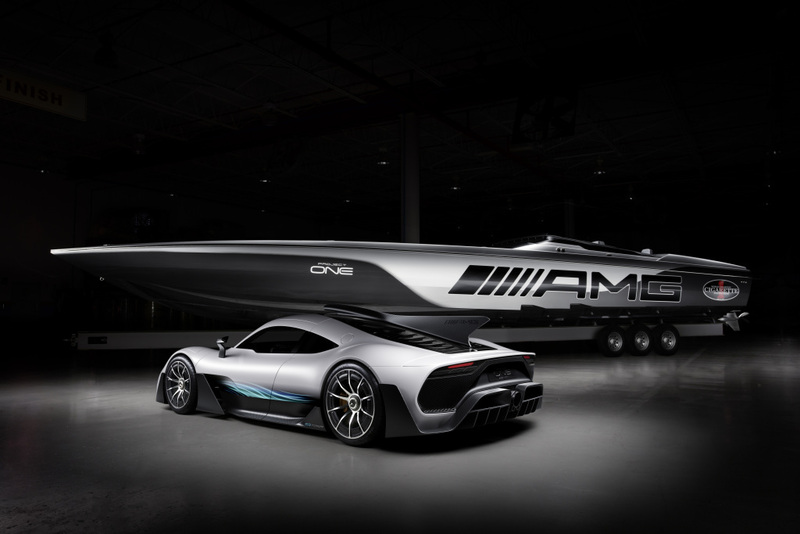 Designed from the ground up using the latest technology and methodologies, the Cigarette Racing 515 Project ONE was inspired by the highly anticipated Mercedes-AMG Project ONE supersports car. The distinctive matte black and silver paint and special badging instantly evoke the unmistakable Mercedes-AMG Project ONE. This attention to every detail extends inside the cabin with extensive use of Dinamica and seatbacks constructed of exposed-weave carbon fiber. The Cigarette Racing Team 515 Project ONE is powered by a pair of Mercury Racing 1,350/1,550 QC4v (Quad Cam 4 Valve) engines and M8 stern drives, delivering up to 3,100 hp. Representing the ninth special edition boat created from this partnership, the Cigarette Racing 515 Project ONE is 51’ 5” in length and features an increased beam of 9’ 6” which allows 6 passengers the ability to be seated comfortably. “By directly translating Formula 1 technology from the track to the street, the Mercedes-AMG Project ONE is our most ambitious and awe-inspiring vehicle yet. 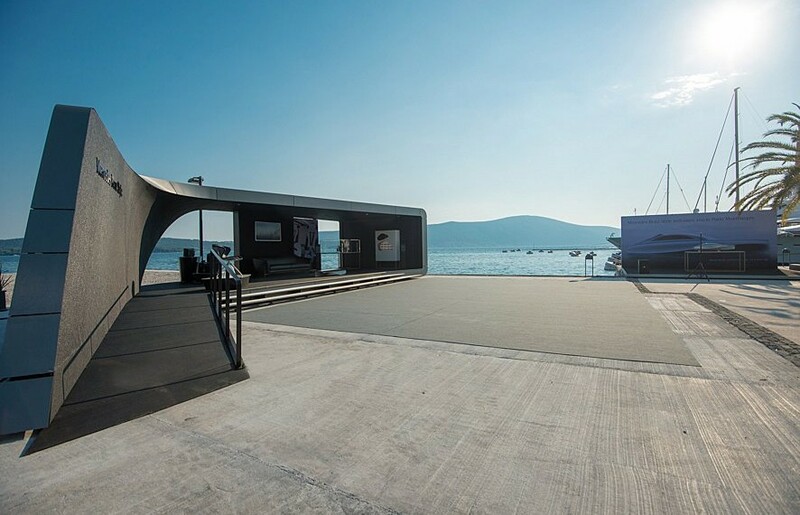 It is incredible to see our vision reimagined for the water in such an impressive and highly compelling form”, says Tobias Moers, Chairman of the Board of Management of Mercedes-AMG GmbH. Representing the ninth special edition boat created from this partnership, the Cigarette Racing 515 Project ONE is 51’ 5” in length and features an increased beam of 9’ 6” which allows 6 passengers the ability to be seated comfortably. The new boat offers an increase of over 30% greater surface area when compared to the existing 50’ Marauder, while still providing similar performance and an impressive 140 mph top speed through the use of a highly optimized composite structure consisting of carbon-fiber, Kevlar® and E-glass. 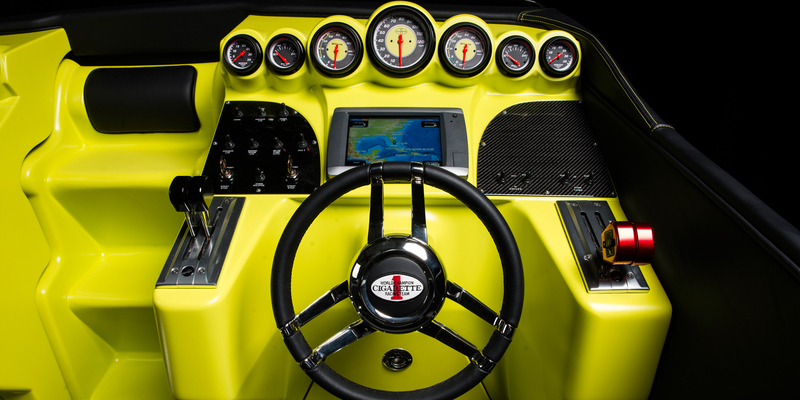 Cigarette’s signature aggressive shoulders, which rise in the rear of the boat, also allow the integration of a large sun cushion on the flat exposed-weave carbon fiber hatch – despite the tall engines beneath – for maximum comfort and versatility when stationary. 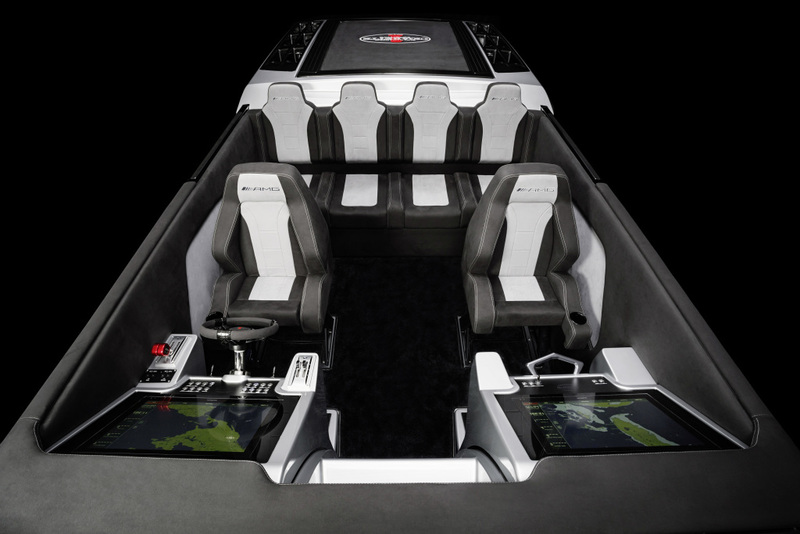 The boat’s deck is constructed completely of carbon fiber to reduce the total weight and lower the center mass of the boat. Carbon Fiber is also used for the inner structural laminate of the hull, forward bulkheads, cabin liner, engine hatch, consoles and storage hatches to significantly reduce the overall weight. For example, the air intakes, which are over 7ft long and 14inches wide, weigh only 4.4lbs. Overall, the weight optimized Cigarette Racing 515 Project ONE is over ten feet longer than the Cigarette Racing 41’ SD GT3 but it weighs over 5,000-lbs less. Kevlar® has also been used for tabbing bulkheads and around the edges of framing for its extreme toughness properties. 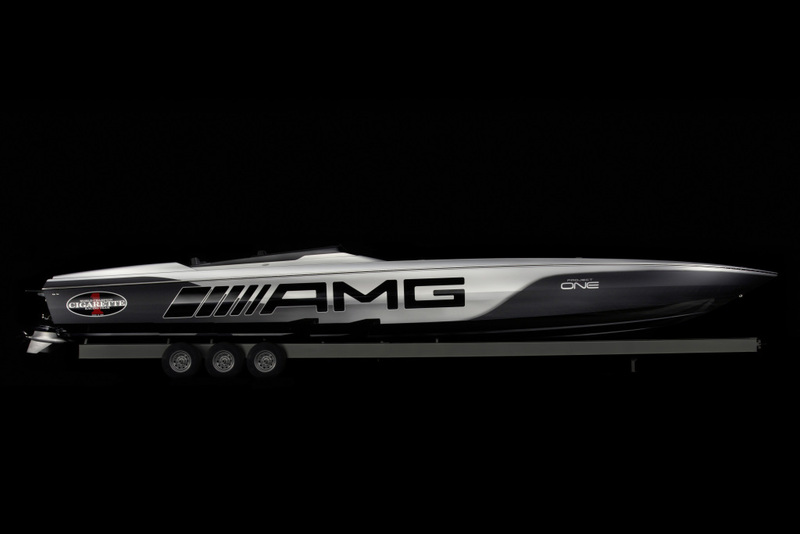 The Cigarette Racing Team worked in close cooperation with Gorden Wagener, Chief Design Officer for Daimler AG, to design the hallmark characteristics of the boat. The distinctive matte black and silver paint and special badging instantly evoke the unmistakable Mercedes-AMG Project ONE. This attention to every detail extends inside the cabin with extensive use of Dinamica and seatbacks constructed of exposed-weave carbon fiber. 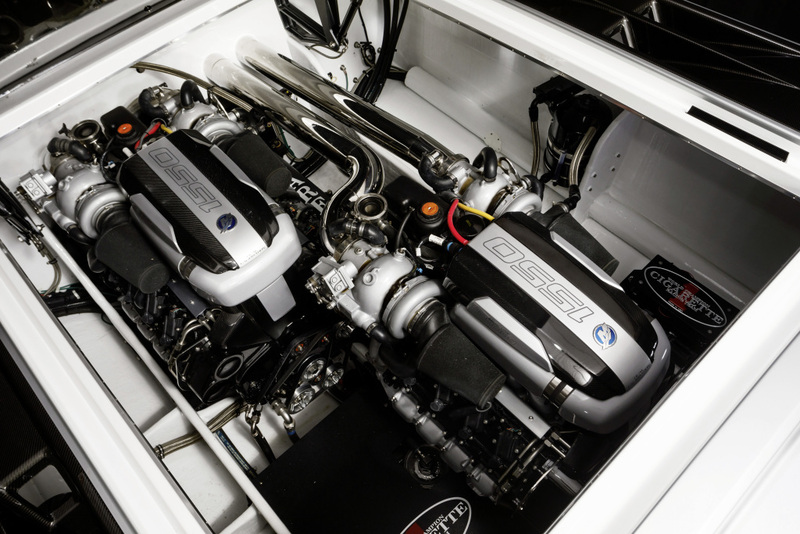 The Cigarette Racing Team 515 Project ONE is powered by a pair of Mercury Racing 1,350/1,550 QC4v (Quad Cam 4 Valve) engines and M8 stern drives, delivering up to 3,100 hp. 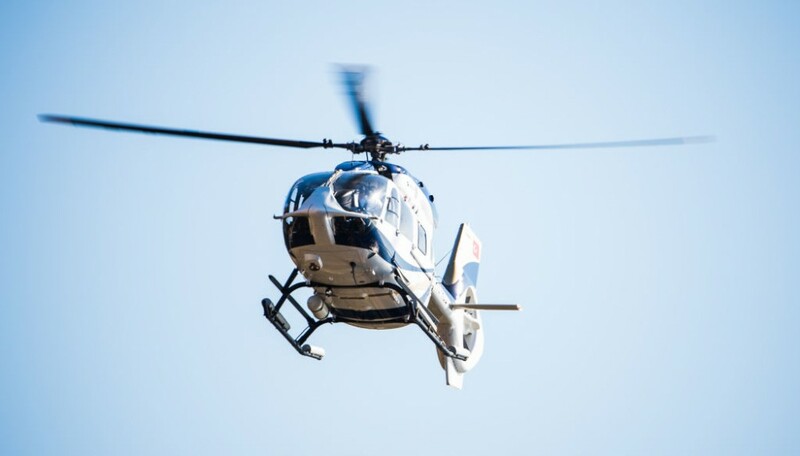 These sophisticated powerplants are dual calibration engines, which enable the operator to switch engine power levels through an electronic key fob. The Race Key fob unlocks up to 1,550 hp, requiring race fuel. The Pleasure key fob is used for operating at 1,350 hp with 91 octane fuel. A staggered engine configuration lowers the center of gravity by allowing the motors to be placed closer to one another, deeper in the vee of the boat, which improves dynamics and stability. 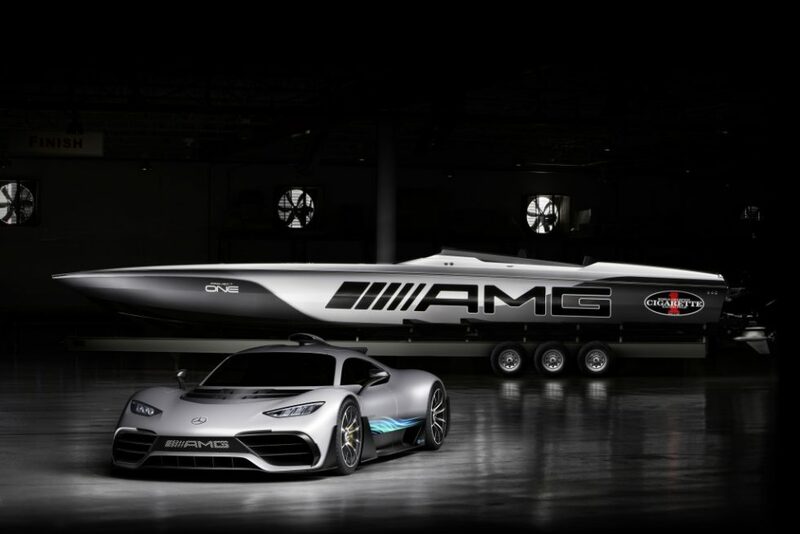 The Cigarette Racing 515 Project ONE draws inspiration from the Mercedes-AMG Project ONE, a two-seater supersports showcar that will bring the very latest and highly efficient Formula 1 hybrid technology from the race track to the road. This mid-engined (ahead of the rear axle) high-performance hybrid showcar will have over 1,000 hp, offer a top speed beyond 217 mph (350 km/h) and reach 11,000 rpm, which is currently unique for any roadgoing vehicle. The awe-inspiring Mercedes-AMG Project ONE will combine outstanding racetrack performance and road capable Formula 1 hybrid technology with exemplary efficiency. The 1.6-liter V6 hybrid gasoline engine with direct injection and electrically assisted single turbocharging will transfer directly from the Mercedes-AMG Petronas Formula 1 racing car. The high-performance plug-in hybrid drive system will come directly from Formula 1, and will be realized in close cooperation with the motorsport experts of Mercedes-AMG High Performance Powertrains in Brixworth, England. 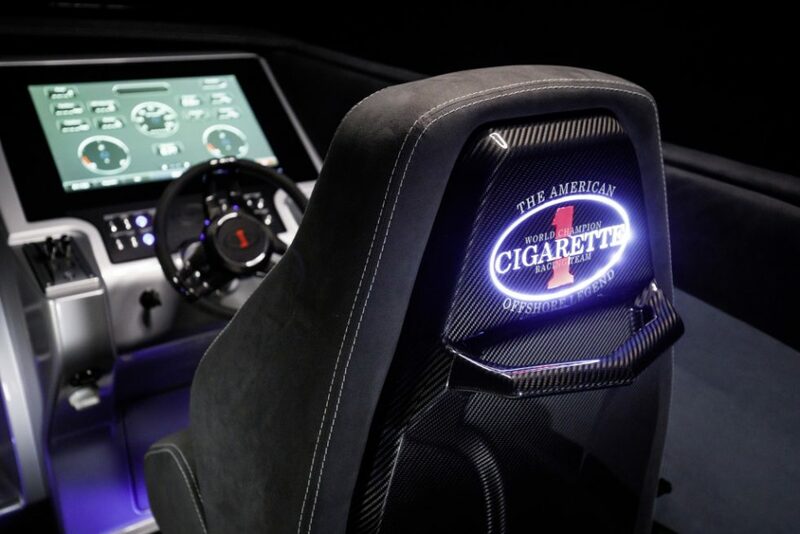 Mercedes-AMG and Cigarette Racing began their collaboration partnership in 2007, primarily for organizing joint customer and marketing activities. Whether on land or water, Mercedes-AMG and Cigarette Racing are united by their focus on delivering the ultimate in performance. 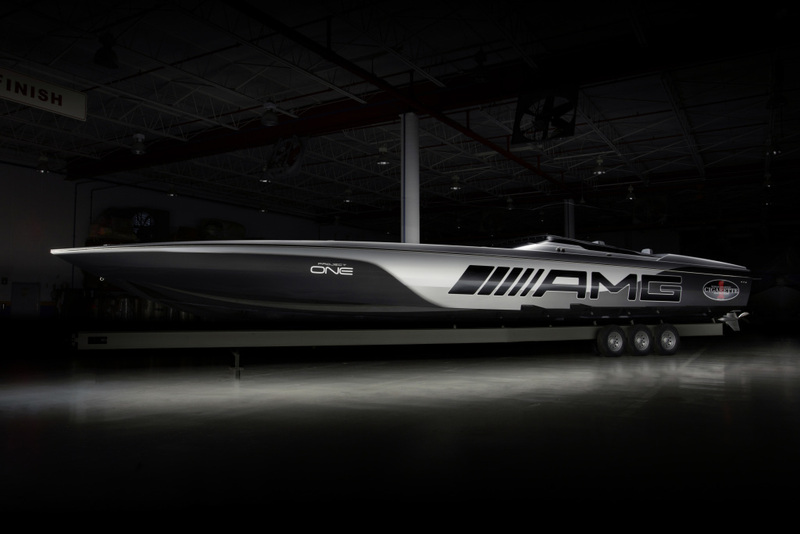 Similar to its Mercedes-AMG super sports counterpart, the 38’ to 51’ 5’ long powerboats from the American specialists are among the world’s fastest and most exclusive machines. The price of this one-of-a-kind boat from the Cigarette Racing Team is available upon request.